Although there were not typical "yearly" updates to the De Lorean, there were several changes that were made to the DeLorean during production. The most visible of these changes related to the hood style. Click on a thumbnail below for a bigger image. The original hood of the De Lorean had groves running down both sides. It also included a gas-flap to ease in the opening to ease in fuel filling. 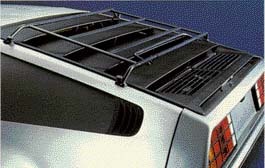 The gas flap was added so that the trunk could be added to the total cargo area of the De Lorean. These cars also typically had a locking gas cap to prevent siphoning. Soon Sometime in 1981 the hood flap was removed from the hood of the cars (although the hood creases stayed). This style was kept throughout the end of 1981 and well into 1982. Based on production numbers for all three years, this hood style is probably the most prevalent. After the supply of locking gas caps was exhausted, the company switched to a non locking version (My car, VIN 3472, does not have the gas flap, but does have a locking gas cap). 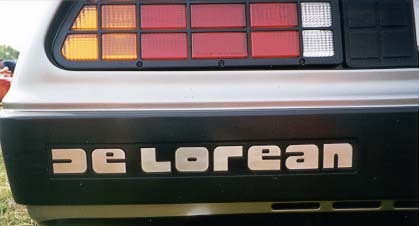 The final styling for the hood included the addition of a De Lorean logo (shown below) and the removal of the groves, resulting in a completely flat hood. The addition of the De Lorean logo to the hood of the 83 models was a nice addition. I have heard of a few owners adding these logos to their "grooved-hood" cars. John DeLorean is well over six feet in height, and he designed the car to comfortably fit someone of his height. What happens when someone of shorter stature gets in and tries to close the door? Oops, if you can't reach the handle, you can't close the door! The addition of a pull strap helped to make this less of a problem.. Foot Rest - As an addition to later cars, a foot rest (in the form of an unusable pedal) was added to the cars to help prevent fatigue while driving. Wheels - There was a change in the wheels on the DeLorean. The look stayed the same, but the coating and coloring of the wheels changed (with these changes also came color changes to the wheel caps). 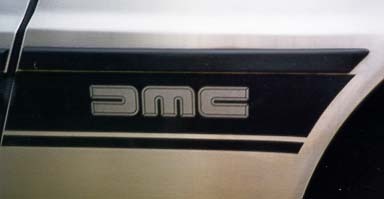 Early cars had gray wheels with gray center caps, later cars had silver wheels with black center caps (the black center caps have the DMC logo done in white). Side Mirrors - Although I can't tell the difference, when I purchased my DeLorean at DeLorean Motor Company Stephen Wynne assured me that there were slight changes to the shape of the side mirrors in the De Lorean. Radio / Clock - The De Lorean came stocked in 1981 with a Craig. Since the Craig did not have a built in clock, there was one installed in front of the gear shift. Later De Lorean's switched to an ASI stereo, and due to the ASI Having a built in clock, the DMC clock was removed. Antenna - What good is an AM/FM radio without a good antenna. As many early DeLorean owners found out, not much. Early 81's had a windshield mounted antenna....and from what I hear, it wasn't much good. The next antenna was a front fender mounted antenna. Not bad for reception, but many people thought that it detracted from the De Lorean's beauty. 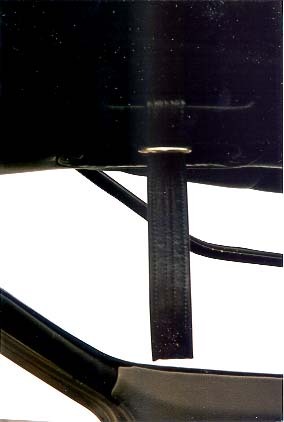 Many people have retrofitted their early cars to the final antenna; a rear mounted power antenna. When retracted, you wouldn't even know it ever existed (unless you knew where to look). Sun Visor - At some point in the De Lorean's life, the sun visors were "flipped." My car has the vinyl part next to the roof (when up). In later cars, I believe the reverse is true. Door Guides - The DeLorean doors usually close great (while the car is level), but had some problems early on when the car was parked on an incline. To help guide the doors down to the striker pins, Door latch guides were added as the result of a service bulletin. These are simply metal pieces with a wedge shaped groove in them to guide the door down into the proper position. Have some dates you could give me, or other changes? Let me know! N/A An aftermarket add-on (originally sold, I believe, by DeLorean One). These are stainless steel "DE LOREAN" letters that fit on the back bumper. This is a true eye catcher. These can now be purchased from De Lorean Steel Products in Germany. A3000010 Roof Rack! For a De Lorean? Sure, although not mounted on the roof (it sits over the louvers). The roof rack is an essential part of the De Lorean. Not only is it good for taking trips, but it becomes essential if you get a flat tire while driving with a passenger. Without the roof rack, you have to make a decision: Which goes with you, passenger or tire. Can't do both. Also available were Ski attachments for the roof rack (Part number A3000011). again, check this out on the Original Accessories Sheet. W300006 (GRY) The original side bolster was leather, and along with the above mentioned production change, was subject to excessive wearing (too many fat butts rubbing it while entering and exiting the car) :)~ A nice accessory is a simple plastic "cap" that fits over the end of the bolster covering up the wear. N/A In addition to the SS 304 Letters that can be added to the back bumper, also available are letters that can be added to the door sills and are visible when the doors are open. These, along with other goodies, are available from De Lorean Steel Products in Germany. SS Labels N/A I have only seen these listed on E-Bay (and bought a set for my car). these are recreations of all of the labels on the car, but printed on Stainless Steel. Very classy! 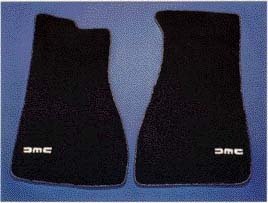 A1000020 (BLK) Originally available only in black, these floor mats help create a "finished" look in any De Lorean. These can now be purchased in either black or gray from De Lorean Motor Company. (click to be directed to there online parts ordering system). Hood Ornament JZ00010 A very rare item, this is a hood ornament in the shape of John DeLorean's head. It attached with a clip to just in front of the hood. This is an iron type ornament and gives the De Lorean the true look of it's creator (just kidding...I couldn't resist...there is no such thing).